The US withdrawal from the Iran deal has been criticised around the globe. The BBC provides a quick video explainer  on the implications of President Donald Trump’s decision for international trade policy, diplomacy and the potential for future conflict. Der Spiegel  takes a deep dive into the consequences for Europe, while Carnegie  explains why abandoning the nuclear deal could empower undemocratic forces in Tehran and assesses how this could further destabilise the Middle East. International Crisis Group  analyses how Libyan reconciliation is negatively affected by a disproportionate focus on individual personalities in key political and military positions, rather than a broader focus on better governance in state institutions as a whole. An older Chatham House research paper  provides a helpful primer to understanding the effects of Libya’s war economy on restoring central governance. The Lowy Institute has developed  a fantastically innovative analytical tool to measure power across 25 countries in the Asia–Pacific region. Country ranking was based on eight measures of power, 27 sub-measures and 114 indicators. The interactive map allows users to explore the overall power rankings and to compare variations in performance between countries. It’s a great tool for anyone interested in understanding the current influence and performance of countries in this region and how power shifts over time. Reporting on conflict is complicated for journalists and their subjects alike. The Columbia Journalism Review  discusses the ethics of reporting on traumatic and sensitive topics through interviews with Yazidi women survivors of sexual violence. On the flipside, Longreads  drills down into the challenges faced by journalists reporting in dangerous countries, their battle against restricted press freedoms, and the role that low media literacy plays in the dissemination and digestion of fake news. Case studies examined are Myanmar and Mexico. This week marked Karl Marx’s 200th birthday. For The Moscow Times, Evan Gershkovich  explores the potential for the influential thinker to become trendy again in Russia and elsewhere. The Economist  also grapples with the continuing fascination with Marx, and shows why it would be a good idea for current leaders to (re)read his theories on capitalism. DW has released an informative documentary  on the relevance of Marxism today. An excellent piece from Foreign Affairs assesses  the future of democracy by exploring the ramifications of increasingly polarised societies , a shift towards authoritarianism, and the effects of security and technology. Technological advances represent one of the greatest factors propelling these shifts because they are likely to create democratic setbacks if governments can’t respond to the changes they introduce—such as the automation of the global economy—fast enough. These challenges are expanded upon in more detail in CapX’s review  of Jamie Bartlett’s latest book The people vs tech , including how companies are able to use personal data to influence the political process. All that being said, the EU’s forthcoming General Data Protection Regulation aims to give individuals more control of their personal data  and to improve the user benefits of the digital economy. The 2018 Budget saw the new Australian Space Agency  funded with $41 million over the next four years , with $15 million of that dedicated  to boosting international collaboration with overseas space agencies. The $41 million is part of a total investment  of $300 million in the Australian space industry. This includes $225 million to enhance GPS and improve access to satellite imagery. It’s a good start , but it’s vital to maintain funding and momentum if Australia is to do more in space in coming years. China has deployed  YJ-12B anti-ship cruise missiles (ASCMs) and HQ-9B surface-to-air missiles (SAMs) to Fiery Cross Reef, Mischief Reef and Subi Reef in the Spratly Islands. Mike Yeo provides a good analysis  on the potential range of these systems, as has the CSIS Asia Maritime Transparency Initiative . Europe’s Airbus launched its future airpower vision . This is similar to a US Air Force video  released last month. 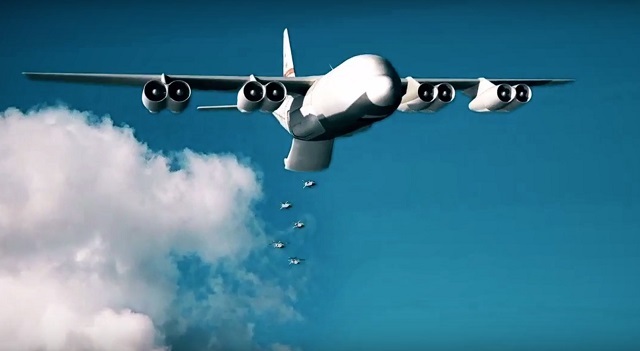 A key component of both videos is swarming drones  launched from transport aircraft, and the US Defense Advanced Research Project Agency (DARPA) is moving closer to making such a capability a reality. China also hinted  about its new H‑20 bomber in a video that looks remarkably similar to Northrop Grumman’s teaser  for the B‑21 Raider. Both the Guardian  and the Times  offer photo series featuring impressions from Russia’s victory parades to mark the 73rd anniversary of the end of World War II. Canberra, 14 May, 5.30–6.30 pm, ANU College of Law, ‘The Timor Sea conciliation’. Free tickets here . Sydney, 18 May, 10 am–5 pm, Sydney Southeast Asia Centre, ‘Politics in action’. Program here , register here . Canberra, 21 May, 6–7 pm, ANU National Security College, ‘Mapping our future: towards an Indo-Pacific strategy for Australia’. Register  now! Sofia Patel is an analyst, Jacqueline Westermann is a researcher, and Malcolm Davis is a senior analyst at ASPI. Image courtesy US Department of Defense.